Here at Mountain Crossings we answer a lot of customer questions about the history behind our shop. Its just the kind of place that seeps interesting tales and makes you wonder. For all those of you who are history buffs, this ones for you! The building that stands nestled in Neel Gap is iconic in the state of Georgia and has a very colorful history to it that goes back long before white settlers came into the area. The Cherokee Indians were the first to settle the area. A small village formed just south of the gap, which they called Walasi-Yi, meaning home of the great frog. In 1838, the Cherokee inhabitants were forcibly removed during the tragic Trail of Tears and nothing remains of the village besides the name Frogtown Gap. A tiny picture of Augustus Vogel and Fred Vogel Jr. who donated the land. Several decade later, the parcel of land the Walasi-Yi Center now sits on was donated to the state of Georgia by the Vogel family of Vogel State Park in the late 1920’s. They were in the logging business and built a log structure at Neel Gap that was used as a tearoom and entertainment area. 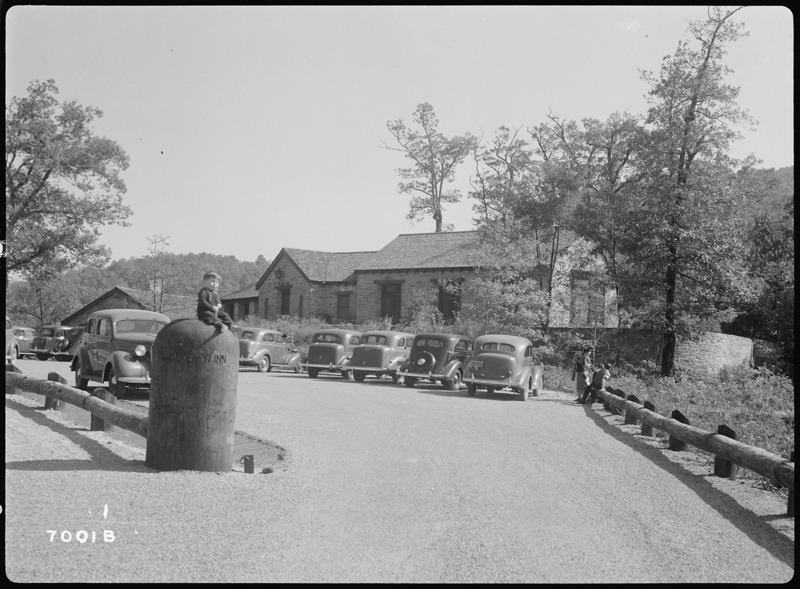 In 1937, the Civil Conservation Corps moved in and made a work camp at Neel Gap. They took natural stone from the surrounding area and began to build up around the wooden tearoom and expanded the structure. They also built several cabins out behind the stone building you currently see from the parking lot today. All that remains of these cabins now are their stone foundations. Walasi-Yi under construction by the CCC boys in 1938. Note the unfinished breezeway and staircase. The Civil Conservation Corp disbanded in 1942 as World War II efforts became the governments foremost priority. 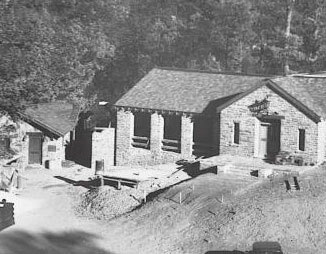 After the CCC camp moved out of Neel Gap, the building was used as a restaurant and inn. What is now the current day gear and gift shop was then a dinning area and ballroom for dancing. The hostel as we know it today was combined with the staff housing upstairs to make up the inn. Still to this day you can see the wrought iron numbers on some of the doors that denoted to the guest which room was theirs. Walasi-Yi functioning as a state run Inn and Restaurant in 1939. The Walasi-Yi Inn and Restaurant was in operation by the state until 1965, when the building was temporarily left unused until a group of artists took it up as a studio space. In 1969, the artists moved on and the building laid abandoned. It was slated for demolition until a group of locals banned together to have the beautiful building placed on the National Register of Historical Places in 1977. George and Logan Seamon, current owners, after being recognized by Outdoor Magazine as one of the Top 100 Outdoor Retailers in the US. In 1983, Mountain Crossings as we know it today was created by Jeff and Dorothy Hansen. They moved into the building that did not have running water or heating and air and started from the ground up what we see today. Between 2001 and 2013, Winton Porter took over, the author of an intriguing book about the characters who are Just Passin’ Thru. Currently, Georganna and Logan Seamon are the owners. 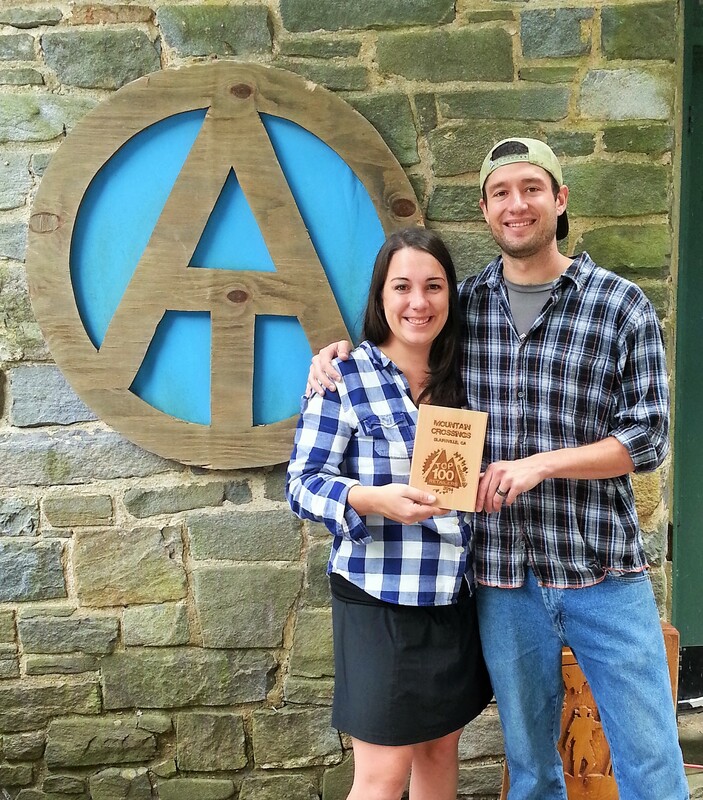 These 2009 thru hikers took possession of Mountain Crossings in November of 2013. Know anything else about the Walasi-Yi Center that we didn’t cover?! We are constantly trying to learn more about the history of our building. Please comment below and give us your insight! This entry was tagged appalachian Trail, CCC, Civil Conservation Corps, History, Inn, mountain crossings, Neel Gap, Restaurant, Vogel, Walasi-Yi. Bookmark the permalink. So how many of you have driven up Hwy 129 from Cleveland, GA, to Blairsville and noticed the old stone building on the right at Neel Gap? Back in the mid 80s when I was a student at Young Harris College I passed by on trips to home and back. I knew the building housed a small hiker store but never knew much else about it until just a few years ago. The folks at Mountain Crossings have given us a little lesson in its history. Check it out! I visited the Crossing when staying at Blood Mt. Cabins (summer of 2016), which is just a mile or so hike through the woods away.